Even the tiniest of apartments can comfortably accommodate a new baby and all of their belongings. While you wait for the big day when your meet your bub, there are several ways you can accommodate your tiny person and all of their adorable belongings in your apartment. Setting up a baby's room for the first time can be overwhelming. There is so much on the market, and everything is so utterly adorable that it is really easy to get carried away! At the end of the day, there really are only four pieces of furniture that are really necessary for caring for your bub: a cot or bassinet for sleeping; a set of drawers for storing all their teeny tiny clothes; a change table (so you don't have to bend down to the floor every time you need to change a dirty nappy or dress your baby); and a comfortable chair for feeding. Everything else is either an added bonus, or a waste of space. TIP: Don't rush out and buy a big fancy feeding chair. A regular armchair is just fine. And remember, if you are pushed for space in the baby's room, just keep your chair in the living room. Then you can watch re-runs of Friends on the TV as you feed! The trick for making a small room work for a baby is to use every surface possible. Baby's clothes are too little to be hung up, so a set of drawers is your best bet for storage. This means you have an entire benchtop free to use as a change table. Place a padded change table mat on top, along with a few pretty boxes to store the nappies and baby-wipes. This will clear up some of that precious floor space for your cot. After your baby shower, you will no doubt come to the realisation that your baby has more clothes than you. However, what people fail to realise is that these clothes are teeny. They certainly do not warrant the need for an entire wardrobe; a few drawers will suffice. So that means a whole lot of wardrobe space to use! Take the doors off that wardrobe, and it will give you extra floor and wall space to play with. 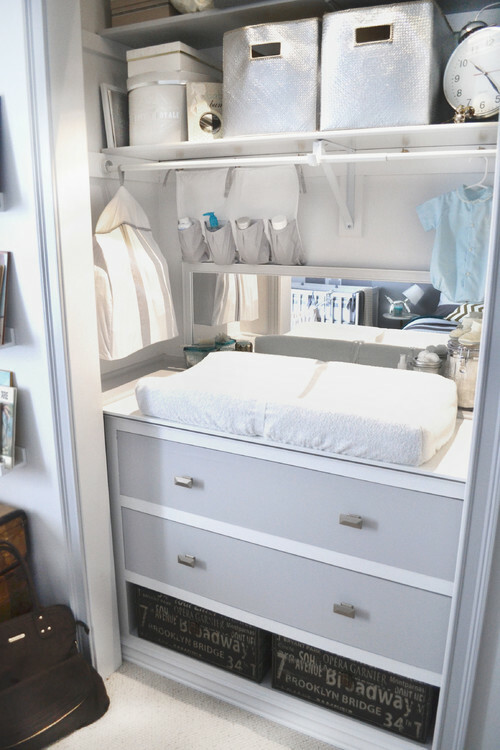 Place the change table or even the bassinet in there, then install some shelves and hooks around the wall for storing all those nappies, wipes and bibs. If you have an odd-shaped room, fear not; you can make any space work. The trick is to find pieces that best fit your room and arrange them accordingly. Cots, bassinets, dressers and change tables come in various shapes and sizes: if you have a curved wall, buy a round cot; if you have high ceilings, use tall cupboards; if you have a long, narrow room (like the one pictured at the top of this article), place all your furniture side by side along one wall and leave the other wall free as a passageway. TIP: If you are really pushed for floor space, forgo the free-standing change table and use an over-the-cot change table. It is essentially a piece of wood with a padded change mat on top that fits over your baby's cot. It can be removed when your baby needs to sleep. Spare yourself the stress of dedicating a whole room to baby when you simply can't spare the space. Have a look around your home; are there any nooks and crannies you can borrow to set up the changing table? Can you take the space under the stairs or invade a study nook and gain privacy with curtains and screens? Remember, this is only a temporary solution – it doesn't have to be forever but it might spare your sanity. Can you spare space in larger rooms such as your living area or bedroom? Pinch a corner of your living space and convert it into a baby's room by erecting a few privacy screens around one small area. The chest under the window here is calling out for a change table. If you still need a study, or a spare room for the in-laws to stay, don't be afraid to make your baby's room work for all occasions. Babies are only small, so really, they don't need an entire room dedicated to them. A little desk in the corner of your baby's room will provide a quiet space for you to work while your baby sleeps. A pull-out sofa in the baby's room is an ideal solution for guests that stay over, and can easily be converted into your feeding chair when you are guest-free. 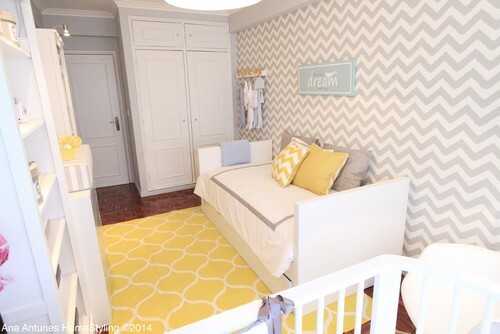 At the end of the day, there is no right and wrong when it comes to designing a baby's room. 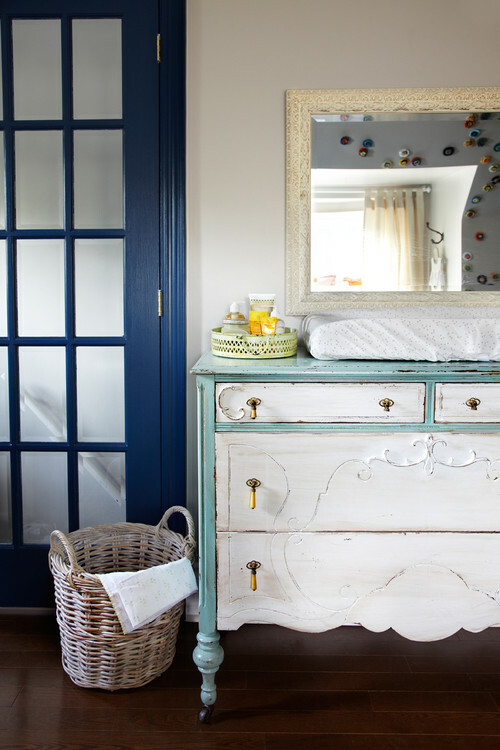 However, try not to get swept up with how cute a piece of furniture is – think practically instead. A piece you adore may be absolutely gorgeous, but if it doesn't fit in your space, you may come to wish you had never set eyes on it.